Tampa Fire Rescue Engineer-Driver John Cannon (left) spots for Capt. Jeremy Finney as he demonstrates the Variable Angle Roman Chair in TFR's Station 1. 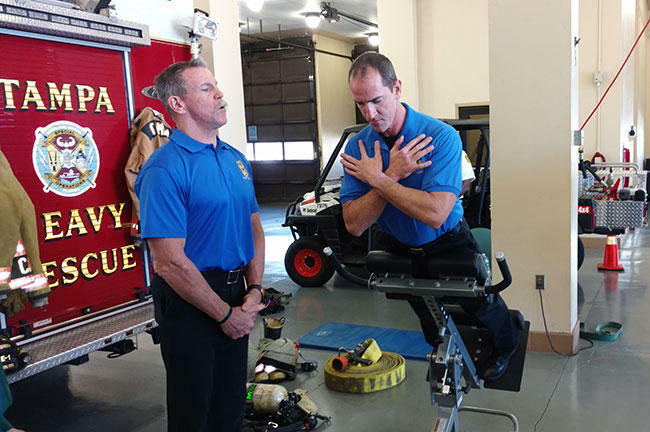 University Beat on WUSF 89.7 report on the USF Health-Tampa Fire Rescue research of back pain. You would think after playing defensive end for the Tampa Bay Buccaneers for nine years, and then 11 more as a Tampa firefighter, John Cannon might have back pain. But the engineer-driver said he feels pretty good, thanks in part to a short exercise program TFR put together with researchers from USF Health - a program that, with the help of a $1.3 million federal grant, will soon be tested by firefighters in the Tampa Bay area's three largest departments. "It’s a wonderful opportunity to do something good for yourself that only takes ten minutes. It’s a commitment, but you’ll reap the benefits," Cannon said. "For that investment of ten minutes, your rewards will be a healthy, long, happy career." That's a lot truer than one might think - lower back injuries are the leading cause of permanent disability and early retirement among firefighters. "The firefighter that sustains a back injury can have pain for the rest of his life," TFR occupational health nurse Tiffany Kline said. "If it doesn’t result in him having to retire early, it’s often a very costly recovery time and puts him off work for a considerable amount of time." And these days, there's concern that any lingering injuries could lead to developing an addiction to painkillers. "We try to avoid that at all costs with our firefighters, and we do that by getting them the appropriate care early on in their injury and ensuring they have the best quality care throughout their recovery," Kline said. The Variable Angle Roman chair that will be used in the exercise study sits in front of a TFR truck in Station 1. That's where the USF Health exercise study enters the picture. The latest work is actually the third in a series of studies led by Dr. John Mayer, Lincoln Endowed Chair of Biomechanical and Chiropractic Research at the USF Health Morsani College of Medicine's School of Physical Therapy & Rehabilitation Sciences. 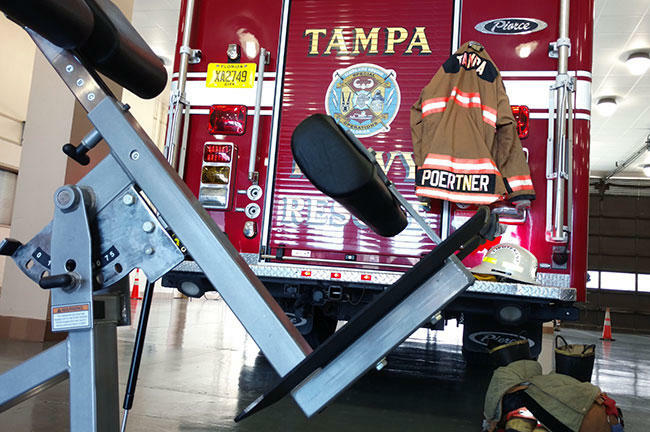 "The first study showed that indeed there is a relationship between poor physical fitness, deconditioning, and firefighters that have back pain or back injury, and that led us to develop an exercise intervention that we tested in the previous study with Tampa Fire Rescue," Mayer said. The first study was published in the American Journal of Health Promotion. The newest intervention begins with stretching to loosen up, followed by a quick workout on the Variable Angle Roman Chair. "The biggest thing for firefighters that we’ve seen is how much time is it going to take me? You know, am I going to have to go places to do the exercises?’" USF Health project manager Charity Lane said. " So it really works because it only takes ten minutes – they do it in their clothing, they don’t have to change. And, if they get a call in the middle of the exercises, they just leave. " Armed with a $1.3 million Federal Emergency Management Agency grant, USF Health will set up the equipment in just over twenty stations and sign up over 300 firefighters from Tampa Fire Rescue, Hillsborough Fire Rescue and St. Petersburg Fire Rescue. 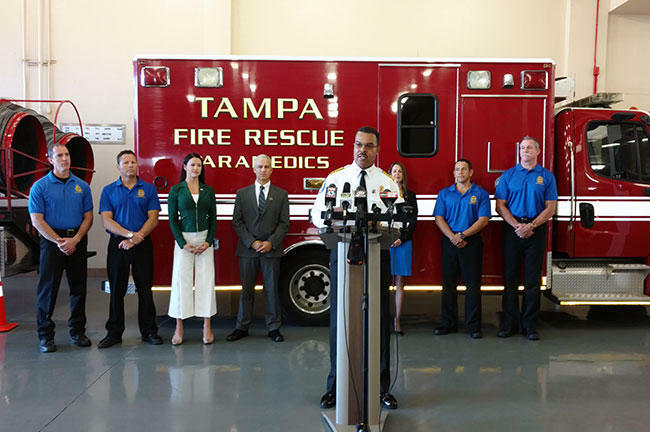 Tampa firefighters and USF Health officials, led by TFR Chief Tom Forward (at podium) announce the study at an April 11 press conference in TFR Station 1. The study will run 13 months, with firefighters signing on over the first four, and then being broken down into three groups - all participants will receive information about the dangers of back injuries and how they can be avoided. Then, one group will take part in back and core-strengthening exercises under the supervision of peer trainers. A second will do the exercises on their own and send results in through a web-based portal. The third, or control group, will do nothing more than receive information. Mayer, the lead researcher, has spent about a decade helping firefighters, but thinks the findings in this study will help other professions as well. "Nurses (have a) very high rate of back injury, police officers, truck drivers," he said. "But this information, if it’s effective, will provide useful information to help...those other groups and there’s an awful lot of high risk groups out there – military, for example." But for Tampa Fire Rescue Chief Thomas Forward, the motivation is to provide help to his fellow firefighters. "We couldn’t be more pleased to partner and collaborate with an institution of such significance like the University of South Florida to get this out, because our entire industry will be positively impacted by this study," Forward said. Results of the study are expected in fall 2017. Last November, the USF chapter of the Pi Kappa Alpha fraternity held its first annual Fireman's Challenge. 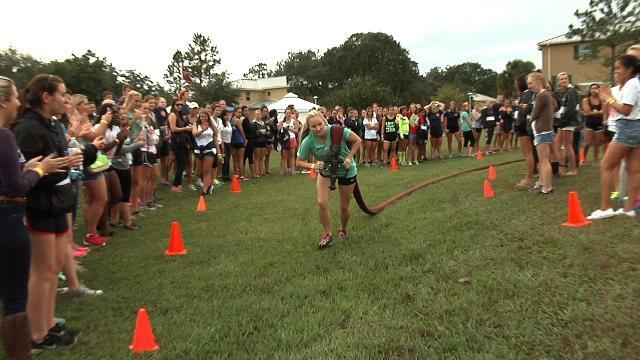 More than 400 members of USF's Greek system competed in a number of contests that mimicked the training of real firefighters, as well as a fire truck pull. The event raised money for a planned memorial for Tampa Fire Rescue members who have died in the line of duty. 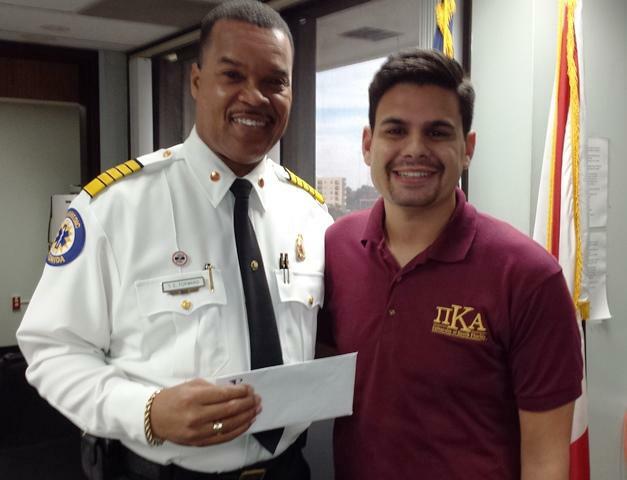 On Friday, fraternity members presented Tampa Fire Rescue Chief Tom Forward with a check for more than $8,600. Members of USF’s Greek system recently braved a wet, dreary November afternoon to show off their firefighting skills. Don’t worry - they weren’t putting out any real fires during the first annual "Fireman's Challenge." “We have five obstacle courses. All the obstacle courses mimic what firefighters go though in order to become a firefighter—their physical examination," said Jordan Romero, a member of the USF chapter of the Pi Kappa Alpha fraternity. When Fred Davis lost both of his legs to infection --he thought his walking days were over. Then he was introduced to a therapy that combines movement and timing to help the brain redevelop motor skills. It’s called Interactive Metronome. For six months, Mederi Caretender therapist Tameka Walker has been helping Davis relearn to walk. "Left hand, right toe, left hand, right toe. Got it?” she instructs. To the chime of a cowbell, Davis steps one foot forward on a mat – and then pulls it back. Then, it’s the other foot, always sticking to the beat.